Cystic fibrosis is a condition that can reduce overall lifespan. Recent medical advances have prolonged life of patients with cystic fibrosis and with increased lifespan come increased interest in the implications of the disease on fertility and reproduction. A recent study published in the journal Current Opinions in Obstetrics and Gynecology, reports current information on the state of the disease in regards to fertility and reproduction. The study was completed by researchers at Yale University and the Touro University Nevada College of Osteopathic Medicine. 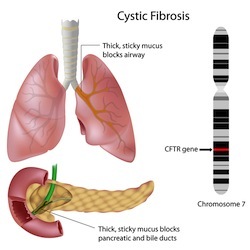 According to recent and current studies, the cystic fibrosis gene may be more prevalent than once thought. Moreover all genes associated with the disorder have not yet been identified. Characteristics of the disease differ between patients. Some male and female patients experience fertility issues, but up to 50% of female cystic fibrosis patients are able to conceive naturally. Conclusion: Fertility problems associated with cystic fibrosis exist for both male and female patients. Assisted reproductive technology may help some patients conceive. Source: Ahmad A, Ahmed A, Patrizio P. Cystic fibrosis and fertility. Curr Opin Obstet Gynecol. 2013 Feb 19.